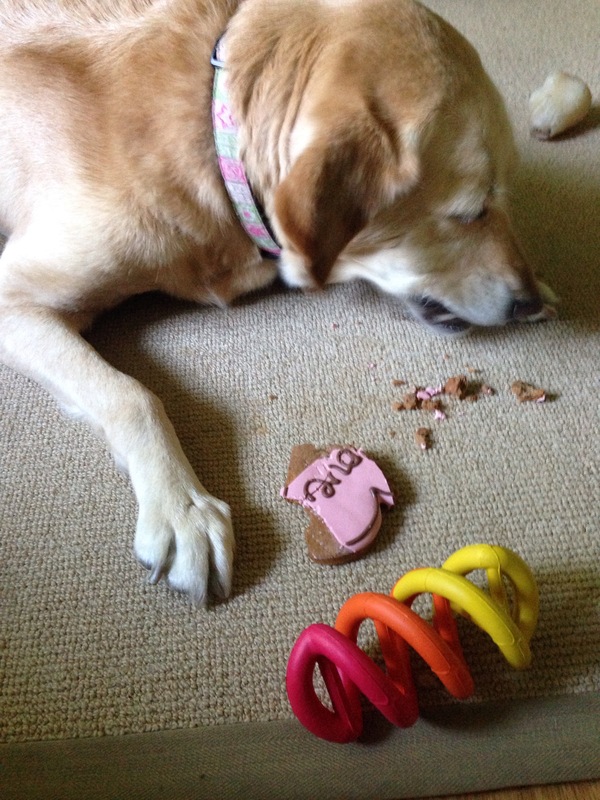 thestoryoflucy | Lucy and her journey through TPLO surgery and beyond. Wow, I’ve not written in an extremely long time. It’s been 4 1/2 years. The good news is that Lucy is still alive and will be 13 years old in a month. The bad news is that she is slowing down very quickly. She has a hard time getting up off of non carpeted floors, and our long walks have adapted to be just around the block. She no longer goes upstairs in my house, so doesn’t sleep in my bedroom anymore. She prefers to sleep on the main floor in one of my kids bedrooms. But she’s still with us and gives us joy every single day. The TPLO surgery was 100% worth it, to have her in our lives this long. If it’s not one thing, it’s another….Lucy had another surgery last week, this time to remove two tumours on her side. They’ve been confirmed as benign, thank goodness. Upon doing the routine pre operative blood work and urine sample, we’re now keeping an eye on her for a possible kidney issue. Sometimes too much information is not necessarily a good thing. Behaviour wise, nothing has changed with her, and I’m hoping that nothing comes about that the vet is concerned about. I would really like a clean bill of health for her, and to see her well into severe old age. I’ll do whatever I can to keep her healthy, but it’s just another thing to worry about. I’m tired of all the worry! Here is Lucy in one of my dads shirts, to prevent her from scratching her stitches. Lucy celebrated her 9th birthday last Thursday. She got a treat and a new toy. Every time someone comes to the house she has to show them the toy, she’s so excited by it. You’d think she was deprived! This Thursday it will have been 14 weeks since her last TPLO surgery. She’s had another X-ray done to confirm that everything has healed well. Shock and amazement (sarcasm), everything has healed beautifully! She’s better than new and has the energy and excitement to prove it. I’m looking forward to a summer of long walks near the ocean or hikes up our favorite mountain. 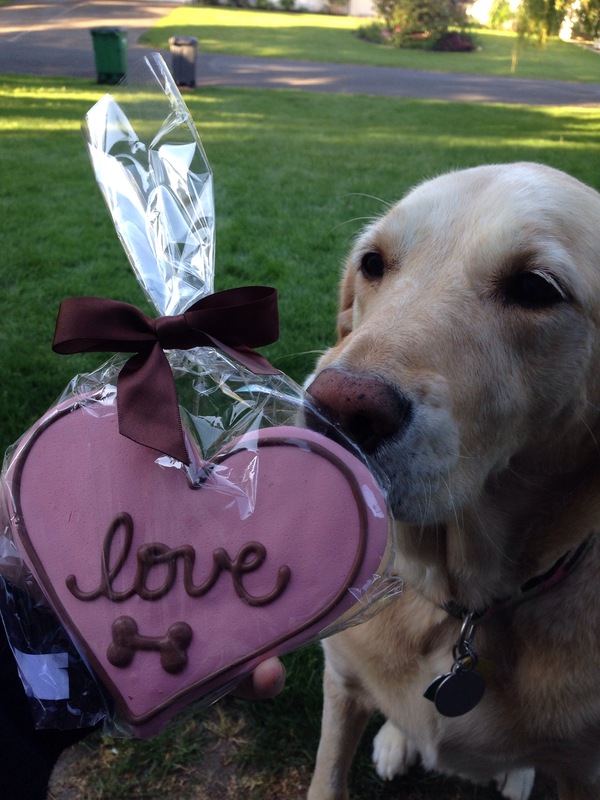 Lucy’s happiness was worth every penny that both TPLO surgeries cost. Obviously, if I was to go back in time, I’d have investigated pet insurance options. But the happiness of my special girl was well worth the aggravation and cost. I’m looking forward to many happy years with my Lucy. It’s been almost 9 weeks since the last TPLO surgery and Lucy has been sprung from her confinement. She went on Saturday to the Central Victoria Veterinary Hospital to get her 8 week X-rays but, being Easter weekend, and no other vet hospital open, they were overly busy. So all of the emergency cases went first and it never got done. We’ll have to wait another couple of weeks, but she’s being given more freedom in the meantime. No big hikes allowed just yet. But freedom to roam the house is a huge treat for her. Here she is begging for cheese from her Grampa. 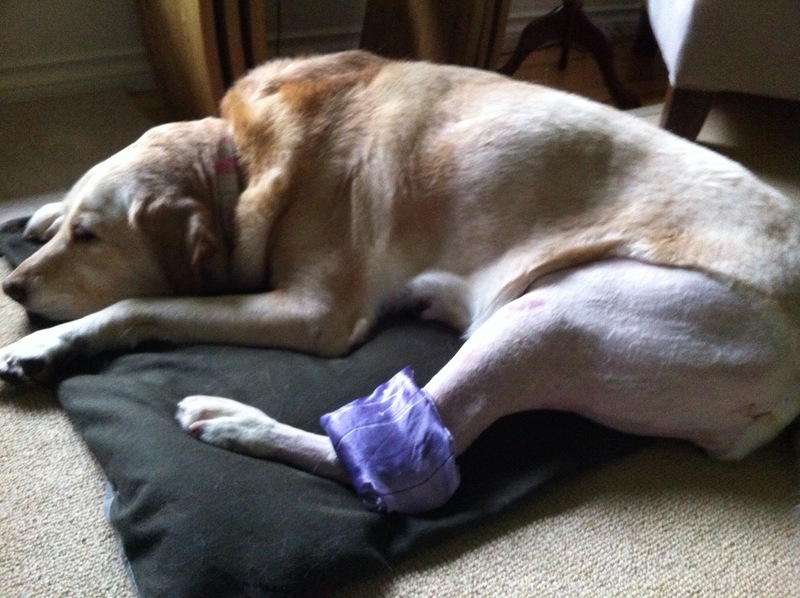 Lucy underwent her second TPLO surgery on Wednesday and she came home on Thursday afternoon. It’s been an easier transition for her this time and she has been more willing to use her “bad” leg than last time. She has toe tapped more often whereas last time she hopped around trying to avoid putting her foot down. She has already sat up to look out the window to see me and the kids come home at the end of the day. Obviously she is still moving very slow and prefers not being outside for her breaks for very long, and she’s not her bubbly self just yet. But, compared to last time, we’re ahead of schedule. This morning her ankle was swollen, so this is a photo of Lucy with her very fancy silk freezer bag, thanks to her very kind granny! It’s pretty lonely tonight. Lucy has had her second TPLO surgery today, and every thing has gone well. She will be staying at the Central Vet Hospital overnight for observation and, I’m sure, some pretty amazing pain meds. I’ll get to pick her up tomorrow at 1pm. While Lucy was under anaesthetic the vet took an X-ray of the first leg that had the TPLO surgery. It’s healing very nicely, which is reassuring that she will be better than new. He also aspirated three lumps to confirm that they were just fatty deposits, which they were. Phew, better safe than sorry. You always hope for the best, but it’s nearly impossible not to let your thoughts go to the worst scenario. He said that the fatty deposits are very common in her breed. He had just operated on another dog who had a 4 lb. fat ball taken out. Wow! that must have been massive. It’s amazing how you get into a routine, though…. I was nagging my daughter after dinner tonight, to feed Lucy because it was her turn on the chore chart. Lucy is not home. Then seconds later, I was chatting with my son, who was doing his chore of clearing the kitchen table, when I mentioned that when he finished we would take Lucy out for her night-time walk. Once again, Lucy is not home. Routine, or my senility, hmmm who knows?! Tomorrow we will be back to the old routine of using a ramp to get her down the front steps, physiotherapy, confinement to carpeted space, and medication. Here’s hoping the next 8 weeks go by quickly, and that she heals as well as the first surgery! Well, on Monday morning the time had come for Lucy to have her second TPLO surgery. It has been 8 weeks since her first surgery and she is back to her normal self once again, but, her other leg also has a torn ligament. So, we were preparing for another 8 weeks of confinement. The hope being that by the summer she would be able to run, jump and play 100%. In we went to the hospital, and she was put through all of the pre op tests. I mentioned to the surgeon that I had been battling an ear infection with her that weekend, and he took a look, took a swab and cleaned it out. To be on the safe side he postponed the surgery and sent us back home with medication and orders to follow up with our vet in a week and then rebook the surgery again. He was afraid that if there is an infection in one part of her body and if he opened her leg up that it would spread to the wound. Better safe than sorry! Needless to say, when I started to take Lucy back to the car, she gave me the same look as the woman in the IKEA commercial that screams “Start the car! Start the car!” She couldn’t believe that she was leaving the hospital with me! When we got home there was a look of pure delight on her face. She’s been full of beans ever since. It’s going to be hard to burst her bubble when we have to go back. Big moment today! Lucy scratched her shoulder with the bad leg!! She didn’t even flinch. It obviously doesn’t bother her anymore. I was so excited to see her use her right back leg the same way she used to. Dogs are awesome. If this was a human we’d still be milking it and laying around moaning. Lucy is doing very well. Her limp is no longer pronounced and she leans more on her paw. She’s been allowing me to touch her leg now, so I’ll be even more diligent with her physiotherapy. 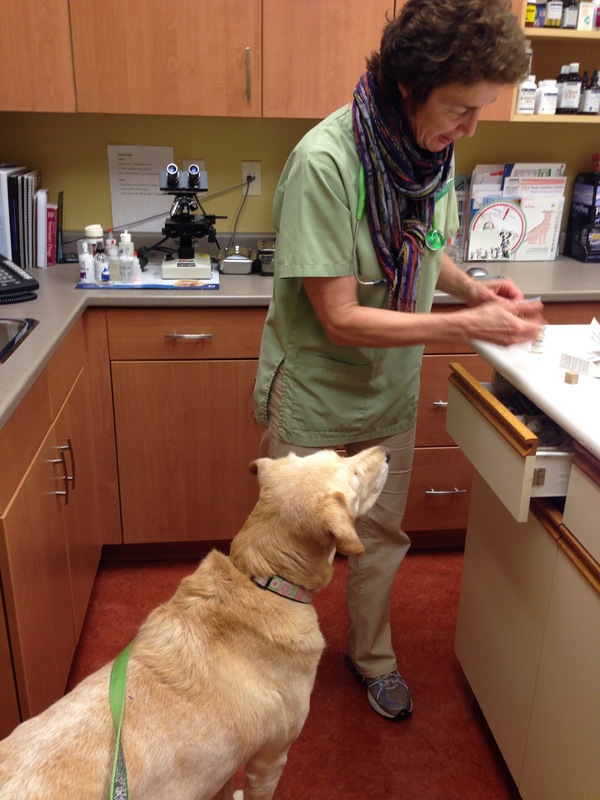 She visited her vet today at, Shelbourne Pet Clinic, to check on her sutures and overall wellness. She has muscle loss in her right back leg, but that is to be expected, as she hasn’t used it fully for several months now. She’s lost some weight, which was planned, so she doesn’t have excess weight on her joints. We’ve started the cartrophen injections again. This will help prevent arthritis forming on the joints as well. She was so excited to get them and more so for the treat afterwards! Overall, everything seems to be going very well. Lucy is showing signs of more improvement. She’s resting more on her paw and likes getting out for longer strolls. The biggest improvement has been her attitude. She doesn’t want to continue to be confined to the living room, so she spent our entire dinner time staring us down from a distance. Oh the whining! She wanted to return back to her normal spot of sitting between my parents chairs. I suppose she figures that if she feels good, then life should return to normal. I wish I could do that, but if her paw slips on the hardwood, it could compromise the healing process. After dinner I joined her in the “enclosure” and she got so excited! I gave her a full body scratching, which she loves, which only made her more squirrelly. 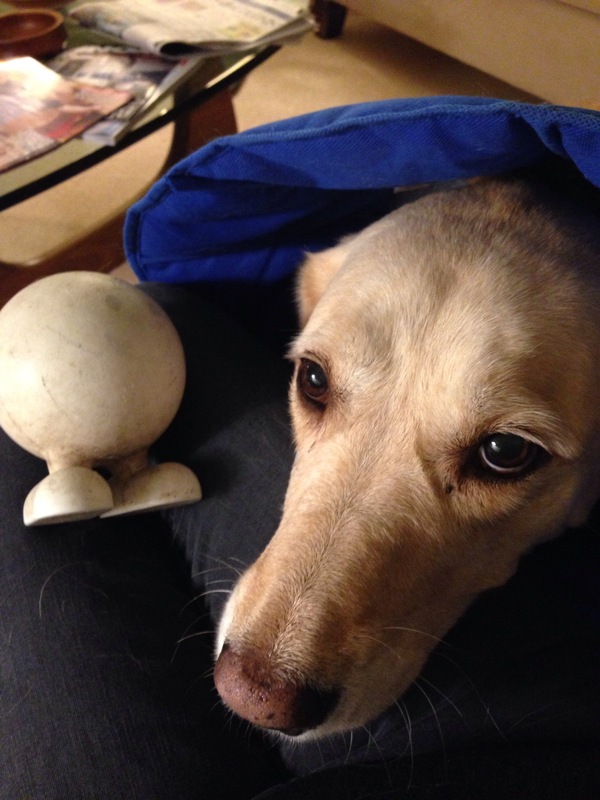 She dropped the only toy she could find on my lap and begged for me to throw it. Poor thing, I had to calm her down for her own good.